The Aliens series – parts of it, anyway – makes up some of the most classic bits of horror and action in the sci-fi canon. Planet Coaster lets you build your own theme park rides. I think you see where this is going. Check out more of the best Planet Coaster creations. 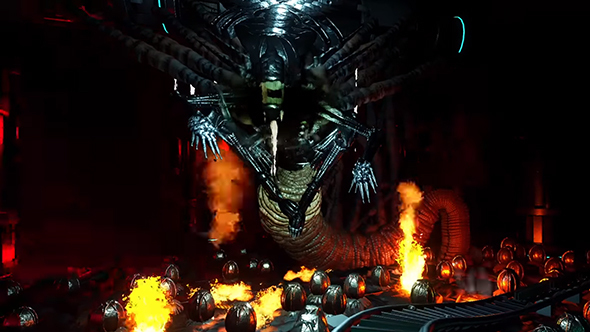 Yes, someone has retold the Alien story in the form of a theme park attraction all built inside Planet Coaster. The creator (Hin Nya on YouTube) has uploaded a full video runthrough of the ride, and it’s a sight to behold. Xenomorphs, violence, explosions, space exploration, and honestly more impressive design work than anything I remember from the last time I went to Universal Studios. It seems the creator is active on the Steam Workshop, but sadly they haven’t uploaded the full ride for your in-game enjoyment. You can however grab the Alien Queen prop for your perusal, as well as an impressively massive park based on Okayama, Japan.